Are You Ready for Chemo? Are You Ready for Chemotherapy? What Happens When Your Treatment Changes? Chemotherapy is one of the most common treatments for cancer. It uses certain drugs to kill cancer cells or to stop them from growing and spreading to other parts of your body. Your doctor might prescribe chemo by itself or with surgery or radiation therapy. You might also take newer kinds of cancer-fighting drugs along with chemotherapy. You can take chemo as pills or shots. You might go to a clinic or hospital so you can get the drugs through an IV, what doctors call an infusion. To help your body regain strength and grow new, healthy cells, you might take the drugs over a few weeks. You might take doses every day, every week, or every month. It depends on the type of cancer you have and how severe it is. Even after surgery to remove a tumor, your body might still have cancer cells. These cells can grow new tumors or spread the cancer to other parts of your body. Chemotherapy drugs help destroy, shrink, or control those cells. It might also treat symptoms the cancer causes, like pain. You might also get chemo to shrink a tumor before your doctor removes it in surgery. There are dozens of chemotherapy drugs that doctors can prescribe. They’re often divided into groups based on how they work and what they’re made of. Each group of drugs destroys or shrinks cancer cells in a different way. Some drugs damage the DNA of cancer cells to keep them from making more copies of themselves. They are called alkylating agents, the oldest type of chemotherapy. They treat many different types of cancer, such as leukemia, lymphoma, Hodgkin's disease, multiple myeloma, and sarcoma, as well as breast, lung, and ovarian cancers. Some examples of alkylating agents are cyclophosphamide, melphalan, and temozolomide. As they kill bad cells, though, they can also destroy your bone marrow in the process, which can cause leukemia years later. To lower this risk, you can take the drugs in small doses. One type of alkylating agent, platinum drugs like carboplatin, cisplatin, or oxaliplatin, has a lower risk of causing leukemia. One type of chemo drug interferes with the normal metabolism of cells, which makes them stop growing. These drugs are called antimetabolites. Doctors often use them to treat leukemia and cancer in the breasts, ovaries, and intestines. Drugs in this group include 5-fluorouracil, 6-mercaptopurine, cytarabine, gemcitabine, and methotrexate, among many others. Anthracycline chemotherapy attacks the enzymes inside cancer cells’ DNA that help them divide and grow. They work for many types of cancer. Some of these drugs are actinomycin-D, bleomycin, daunorubicin, and doxorubicin, among others. High doses of anti-tumor antibiotics can damage your heart or lungs. So your doctor will have you take them for a short time. Drugs called mitotic inhibitors stop cancer cells from making more copies of themselves. They can also stop your body from making the proteins that cancer cells need to grow. Doctors might prescribe them for breast and lung cancers and types of myeloma, leukemia, and lymphoma. Mitotic inhibitors include docetaxel, estramustine, paclitaxel, and vinblastine. Another type of medicine, called topoisomerase inhibitors, also attacks enzymes that help cancer cells divide and grow. They treat some types of leukemia and cancer of the lung, ovaries, and intestines, among other types. This group of medicine includes etoposide, irinotecan, teniposide, and topotecan. Some of them, though, may raise your odds of getting a second cancer a few years later. Steroids are drugs that act like your body’s own hormones. They are useful in treating many types of cancer, and they can keep you from having nausea and vomiting after a round of chemo. They can also prevent allergic reactions to some of the drugs. Some of the steroids your doctor might prescribe are prednisone, methylprednisolone, and dexamethasone. 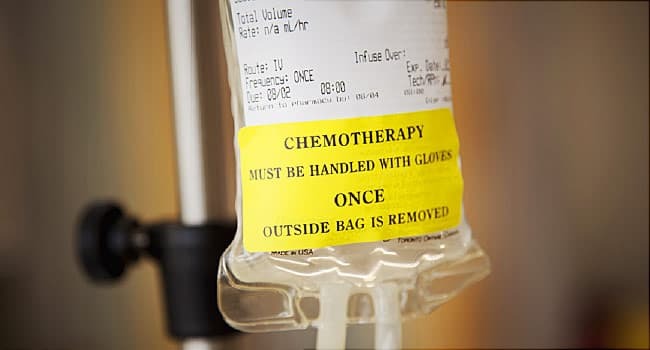 Chemotherapy is a common cancer treatment, but today, doctors often prescribe other kinds of cancer medicines, such as targeted therapies, hormone therapy, and immunotherapy. Unlike chemo, these types of medicine are better at attacking only cancer cells and leaving healthy cells alone. That means they cause milder side effects. Your doctor might recommend that you take them along with chemo drugs or on their own. Your oncologist will watch your body’s response during and after treatment. She’ll look for signs that your tumor is shrinking or growing. She’ll use tests like physical exams, blood tests, or imaging scans like X-rays. If your treatment doesn’t seem to be working, she might give you a different dose or a mix of other treatments.